Nearest major intersection: Brtiannia Rd. and Winston Churchill Blvd. On-street parking is available free of charge on McDowell Drive and nearby streets. There is no maximum time limit for on-street parking on Canada Day. 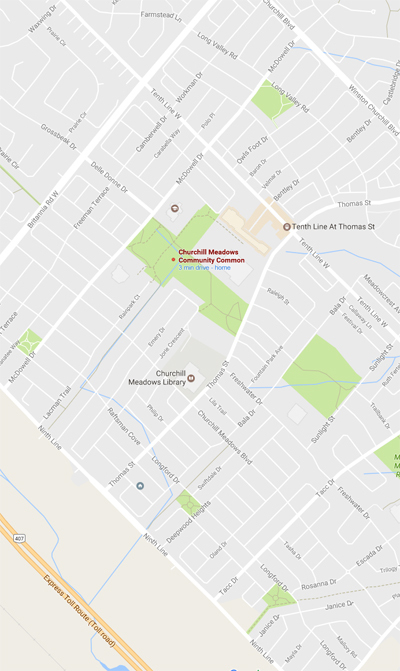 There are also many parking lots nearby—the best option is Churchill Meadows Activity Centre at 3801 Thomas Street. Other lots nearby include Churchill Meadows Public School, St. Faustina Catholic Elementary School, Stephen Lewis Public School, St. Joan of Arc Catholic Secondary School, and Brittany Glen Plaza. (These lots are on private property, however.) The parking lot within the park itself is reserved for entertainers, vendors and special guests. Please WALK, CYCLE or take PUBLIC TRANSIT to the festival if possible. The #46 bus runs along Tenth Line until about 9 p.m. and the #9 bus runs along Thomas Street past 11 p.m. on July 1st. Check MiWay for the latest schedules. The majority of activities and entertainment will take place on Field #1 near the splash pad, playground, washroom facilities at Churchill Meadows Community Common. 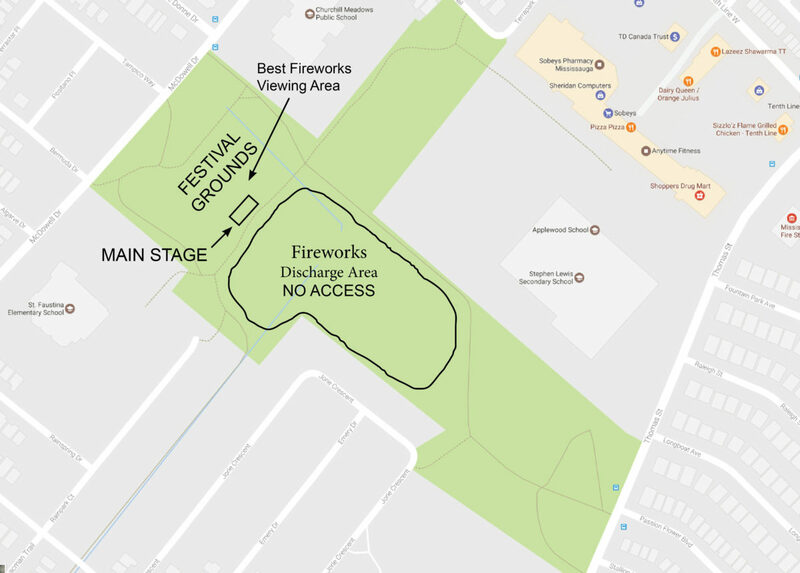 The best place to view the Fireworks will be on the main festival grounds in front of the stage, as the fireworks will be set to music featuring a variety of Canadian musicians. Please do not enter the restricted area (fenced off, caution taped) so as to avoid personal injury and for the safety of those shooting off the fireworks. Please note that NEW THIS YEAR, organizers will be closing the trail that connects the northern and southern parts of the park from 9 pm to 10:30 pm to enlarge the restricted area for everyone's personal safety. There is a 'fall-out zone' along the south-eastern part of the restricted area where fireworks debris may blow, depending on weather. Please keep back and pay attention to the signage in the area. Thank you!